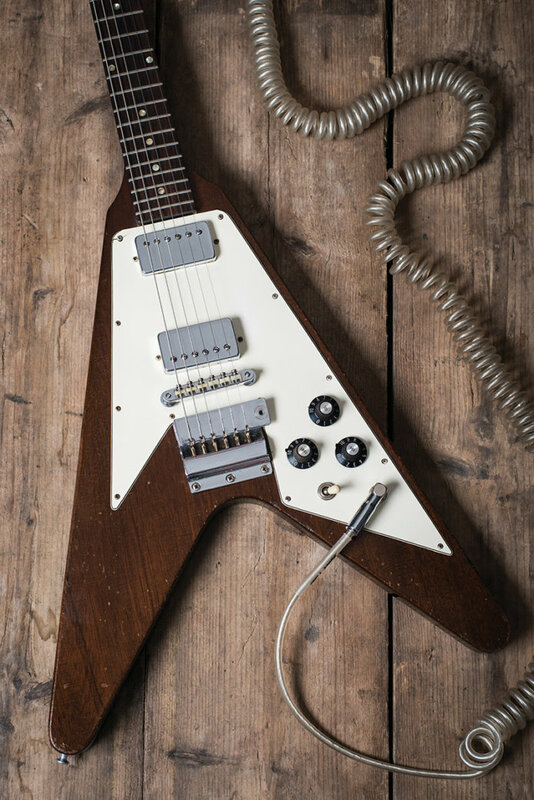 These days, the Flying V is associated with rock and metal players including Andy Powell, Leslie West, KK Downing, Kirk Hammett and the Schenker brothers, but the model has done its fair share of pop too – notably in the hands of Dave Davies and Marc Bolan. It’s also worth noting that three of SRV’s favourite players used the V. Hendrix may have come to the model relatively late in his career, but Lonnie Mack and Albert King played them throughout theirs. However, the Flying V of the late 1960s wasn’t so much a reissue as a reimagining of the 1950s version. The pickguard changed shape, there were no pickup surrounds, and a Maestro vibrato anchored the strings rather than through-body ferrules. More significant was the change from korina to mahogany. 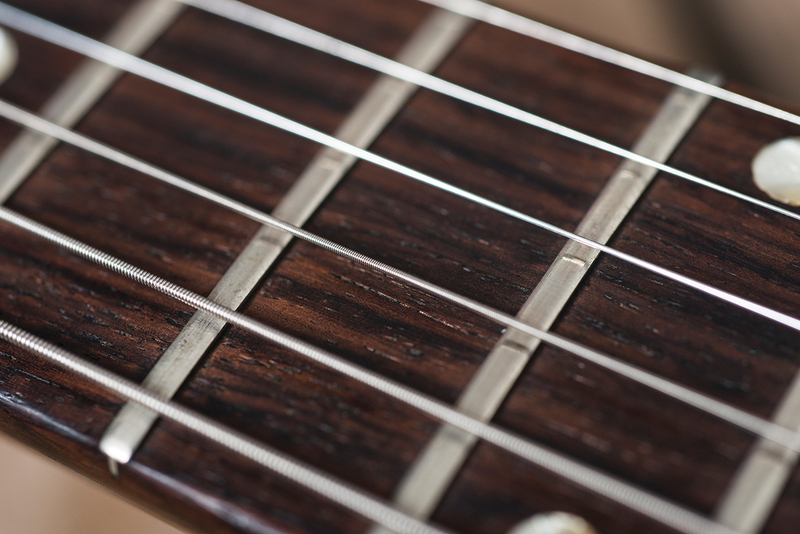 In the process, the body shoulders were softened to improve upper fret access. For the minutiae we are indebted to The 1967-1971 Gibson Flying V Website (1967-flyingv.weebly.com). From this extraordinary resource, we learn that Gibson made just 175 Vs between 1966 and 1970. Production was divided over five batches, each with distinguishing characteristics. 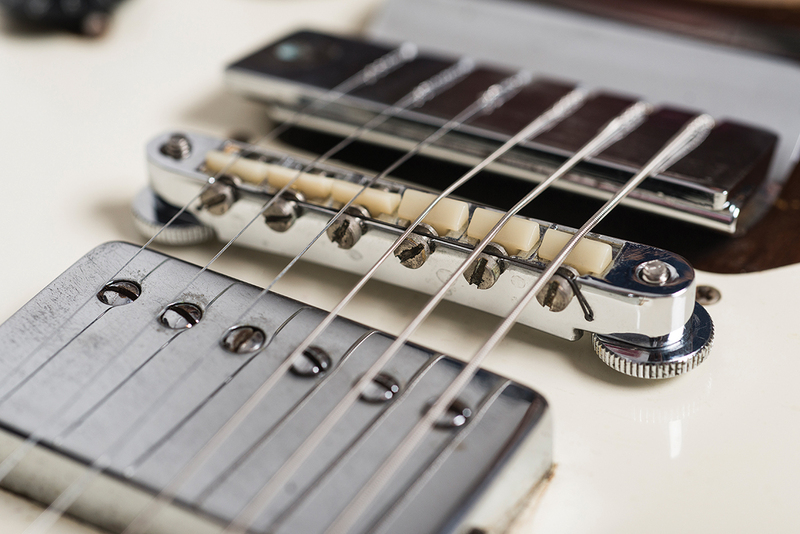 Besides two 1966 prototypes, the first four batches were made in 1967 and only the fifth batch of guitars was built in 1969. On close examination, it quickly becomes clear that this Flying V is from the final production batch because it has the three-piece laminated mahogany neck and a serial number on the rear of the headstock to match. Having already established the rarity of late 60s Vs, there are two other factors that lift this to the top level of collectability. The first is the mundane but all-important fact that it has never been subjected to the common tuner and tailpiece modifications, and the second is the black lacquered headstock face. The vendor is basing a theory on the black headstock. Apparently, this is the only known example from batch five that has a factory painted, black headstock face. This leads Mike Long from ATB Guitars to suggest, “This could be one of the very first, if not the first, batch five Vs to be made, as it does have other batch four features, such as multi-coloured wiring”. 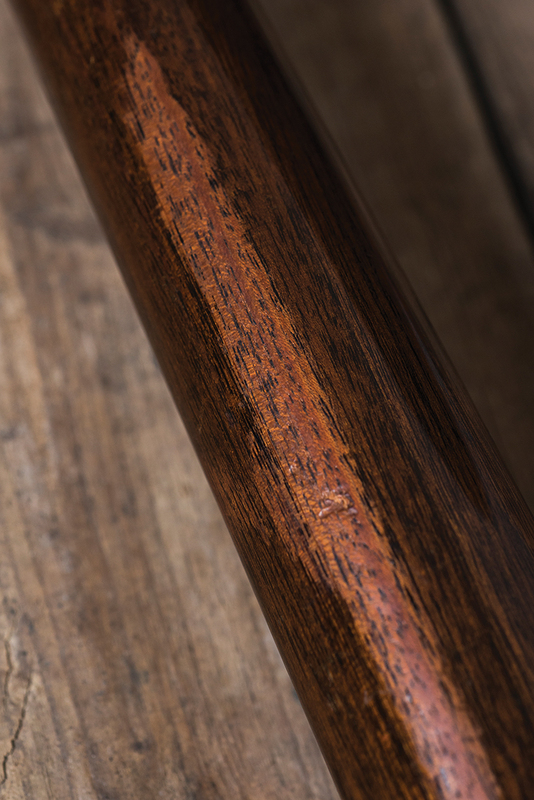 Of the four finishes – Sunburst, Sparkling Burgundy, Cherry and Walnut – only 35 walnut Vs were made in the 1960s and this is one of them. Treble bleed capacitors were once installed across both volume pots, but they have now been removed. 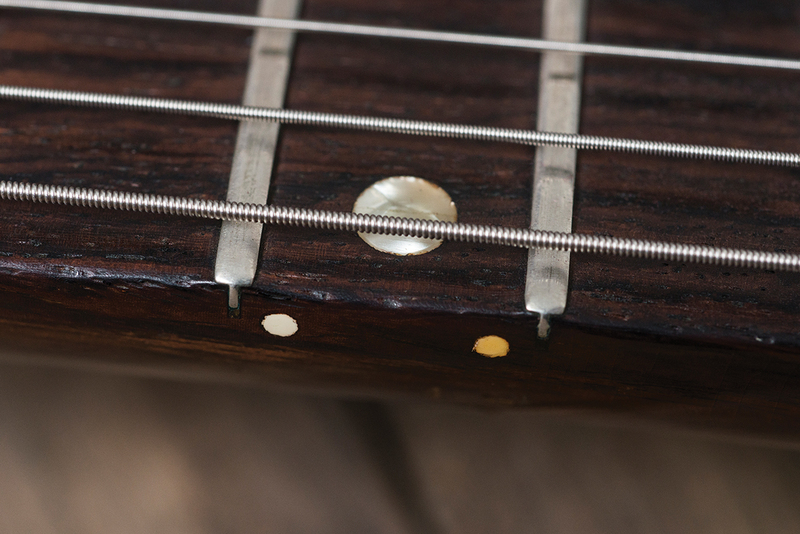 The bridge posts may have been relocated to improve intonation – something Gibson often got a bit wrong – but the filled pickguard holes under the thumbwheels are very hard to see. Under the pickguard, a tiny patch 1mm deep has been removed from the body to provide clearance for the jack socket. This may have been done at the factory, or to clear space for a replacement. The white ground wire has been replaced but besides these non-originality issues, the only structural damage is a minor pickguard crack. 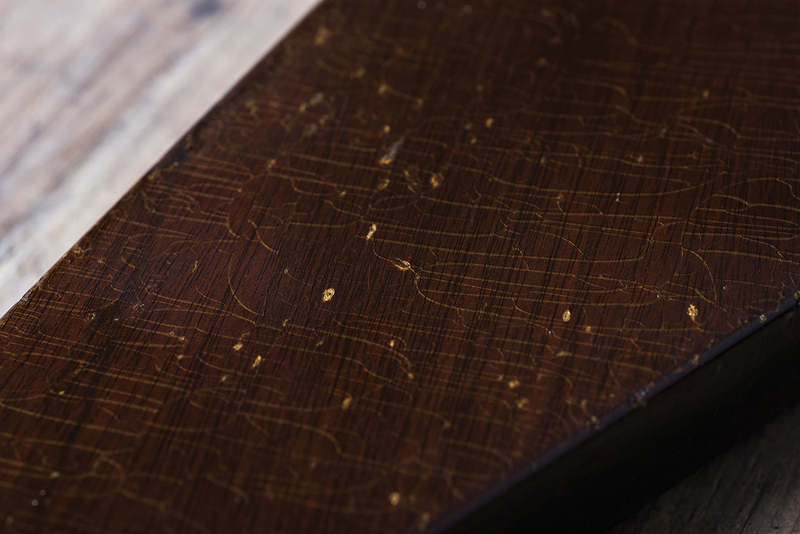 We’ve previously suggested that a lightweight mahogany body with a set mahogany neck is a close as you can get to a sure thing for great guitar tone. This V only strengthens our conviction with its exceptional ringy and exuberant unplugged sound. It’s also so sleek and light you might think it can indeed fly. Given the selling price and rarity, we decide against testing this out. If you haven’t tried a V from this era, the best description we can give is that it’s not unlike a vintage style SG, but the weight distribution provides the V with far better balance. While it’s not especially practical sitting down, it behaves impeccably on the strap. What’s more, the proportions ensure your picking hand ends up in exactly the right position. So, while it may look unusual, it’s actually supremely comfortable. 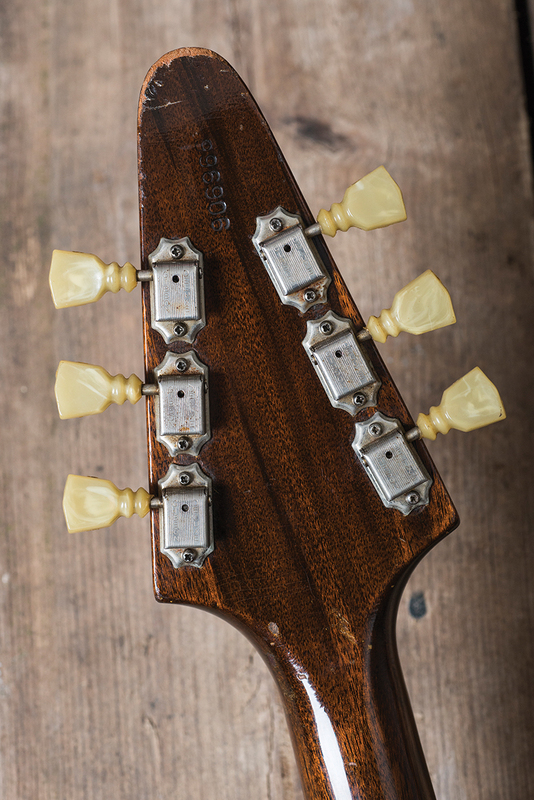 The neck’s depth and fatness come as a surprise, but the V might feel flimsy without it. 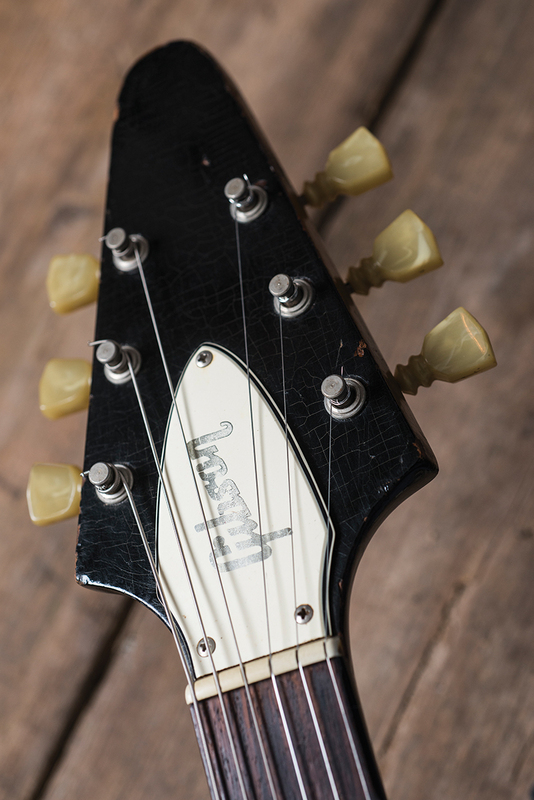 It also has some of the soft-shouldered grace that we’ve come to associate with the best of Gibson’s 50s necks. We suspect it might play even better if the frets were a bit taller, but even so it verges on the effortless. Comparing the V with a Les Paul Custom from the same year, they’re worlds apart sonically despite having the same Patent Number humbuckers. Although the V doesn’t have the Custom’s sheer power, it’s much brighter, clearer and more dynamic. It also cleans up particularly well, which makes the fact that someone once installed those treble bleed capacitors all the more baffling. The V’s inherently bright and harmonically rich tone is able to make its presence felt through an amp. 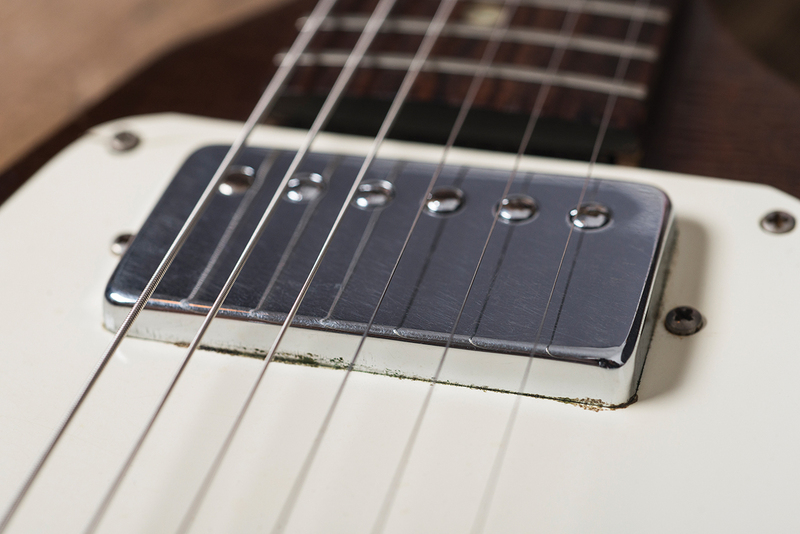 Combined with the Patent Number humbucker’s characteristic upper mid resonance, it’s a recipe for clean jangle and dirty bite. The V is closer to the fat-Strat tonality of a Firebird than an SG or Les Paul. In essence, this Flying V is a fantastic all-round Gibson that delivers the goods across the board regardless of amp settings. A missing arm bolt precludes us from testing the Maestro, but pressing the mechanism by hand puts the guitar straight out of tune. 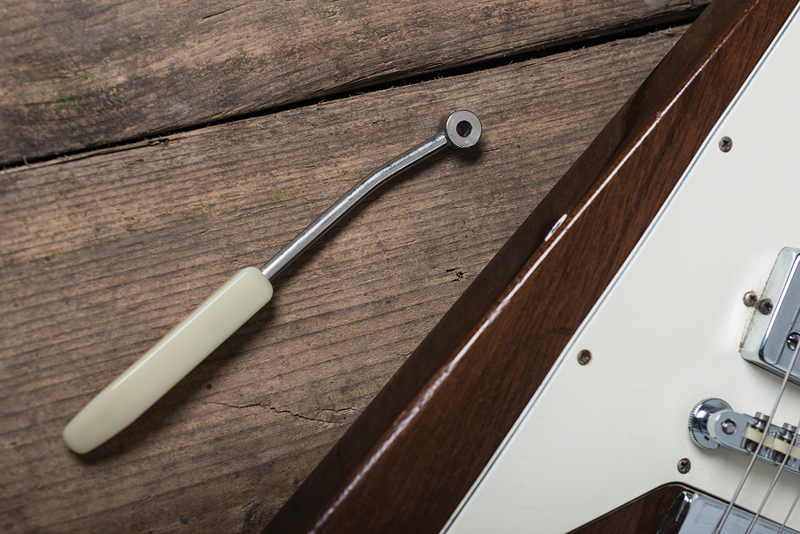 So long as you can resist the temptation to use the vibrato, this V holds its tuning superbly. If you have pre-conceived ideas about Flying Vs, this may make you reconsider – or even convert you. 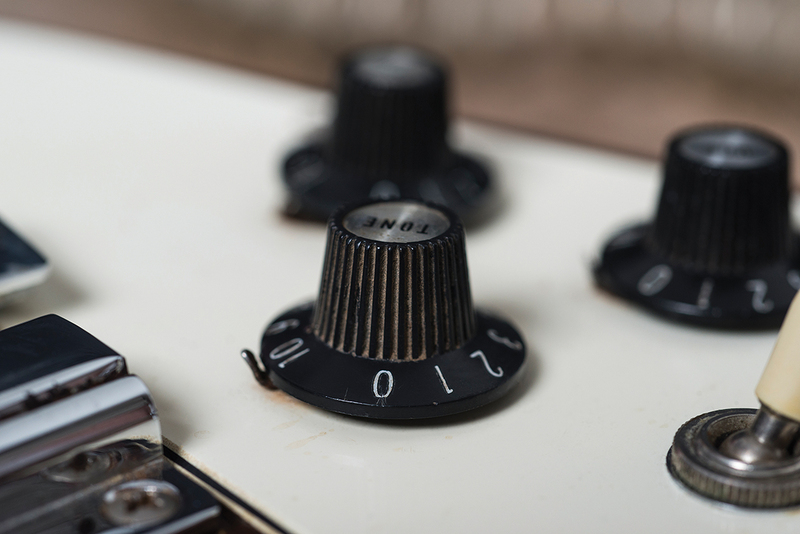 As a player’s instrument, its value extends well beyond its stage appeal and it’s easy to understand why some guitarists who were lucky enough to get their hands on a Flying V 40 or so years ago have been playing them ever since.